My Field Trip to Eulogy! 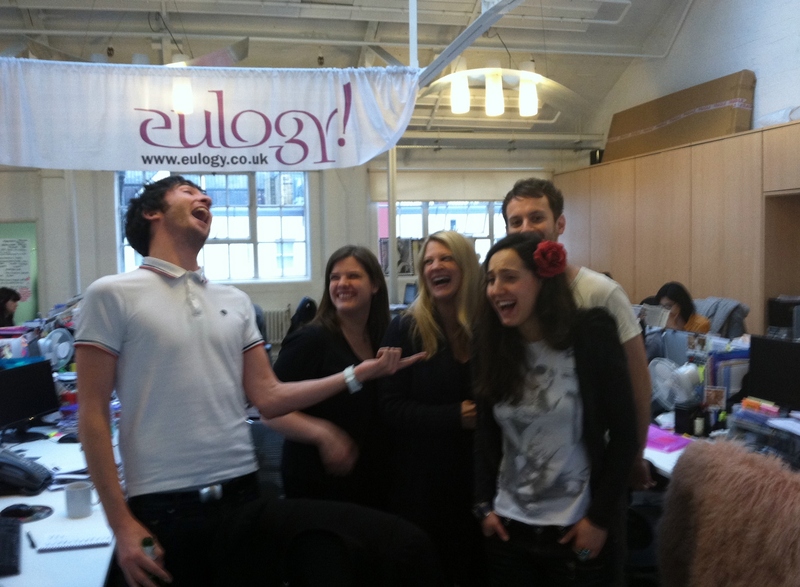 Last week I had the pleasure of meeting with Eulogy!, our sister agency in London. Fresh off our partnership announcement, it provided the perfect opportunity to learn firsthand about the company and discuss the innovative ways in which we plan to work together in the months ahead. Upon reaching Eulogy!’s offices in West London, I was greeted by Mark Barber, Director of Business Development, with a giant hug and tons of enthusiasm. 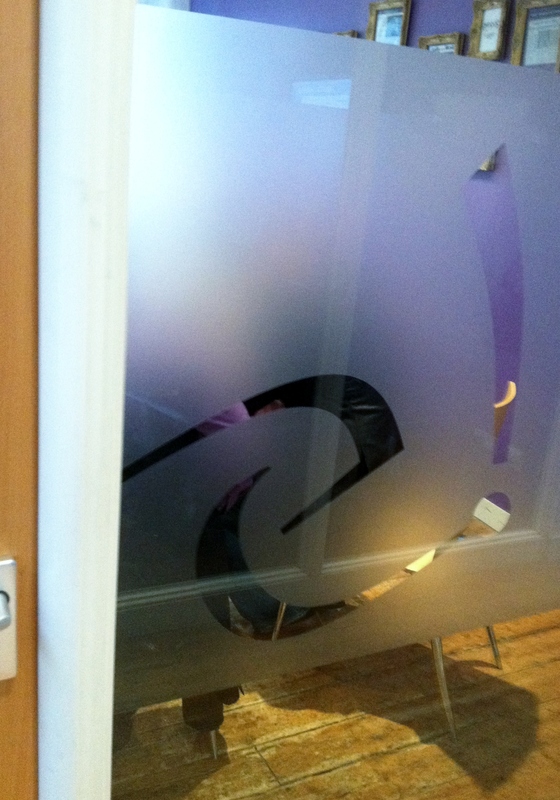 As he took me on a brief tour of E!’s offices, I was immediately struck by the similarities between our two offices. DGC and E! both have open-floor plans, complemented by a few cozy nooks and conference rooms designed for brainstorms and meetings. Along the way, Mark pointed out the heaps of press they have garnered for themselves and for their clients—I love how proud they are of their work. The next stop on my tour was CEO Adrian Brady’s office. Adrian couldn’t have been nicer or more welcoming. We chatted about his days living in Chicago (like me), overlaps and opportunities to cross-pollinate our clients, and his excitement about our new partnership. Again, I was reminded of our similarities. 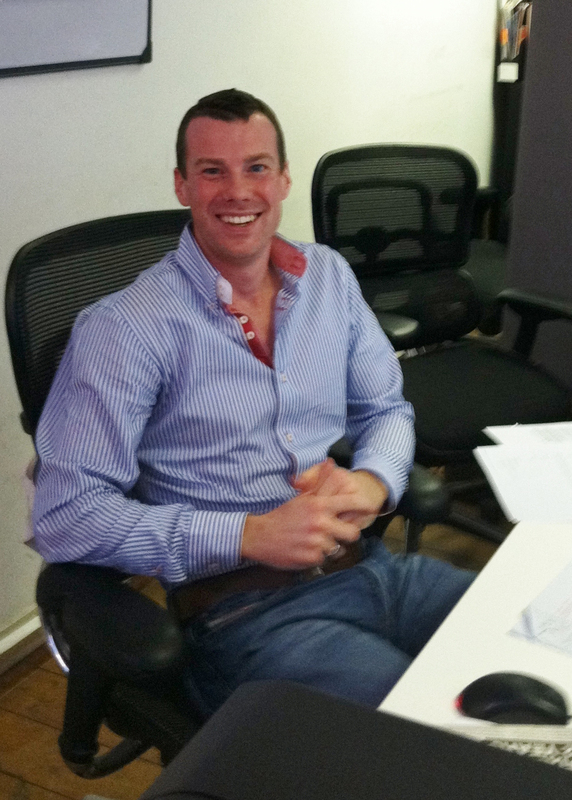 An entrepreneur at heart, Adrian started Eulogy! in 1996, with Marketing Magazine recognizing it as one of the country’s fastest growing PR agencies in the late ‘90s. Industry awards success has included recognition from the prestigious PR Week, Business to Business Campaign of the Year and the International Public Relations Association Golden World accolade, as well as being voted one of the Top 40 independent PR agencies by PR Week. Over the next few hours, Mark and I spent time brainstorming innovative ways to combine our business development efforts and–most importantly–learn from one another. E! has been around about twice as long as DGC, and has a very evolved consumer practice, something DGC is also making great inroads with. One of the highlights of my day was lunch. Mark and Issie (Team MEC) were kind enough to pause their busy days and take me to lunch at Black and Blue–a real London power-lunch scene. In true European fashion, we toasted with a glass of wine and lingered over cappuccinos before heading back to the office. I hope to one day host the two of them in New York City. 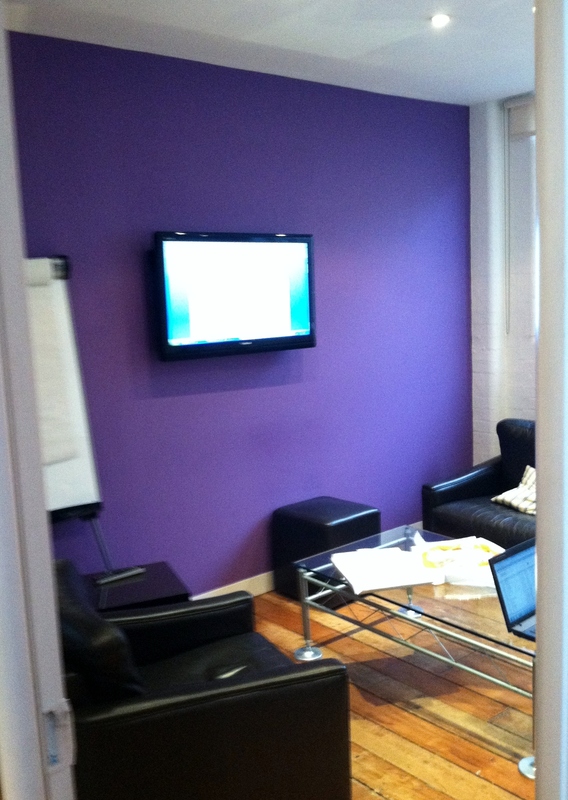 The afternoon was a blur as Mark set up a work station for me and I touched base with DGC on a few client deliverables. 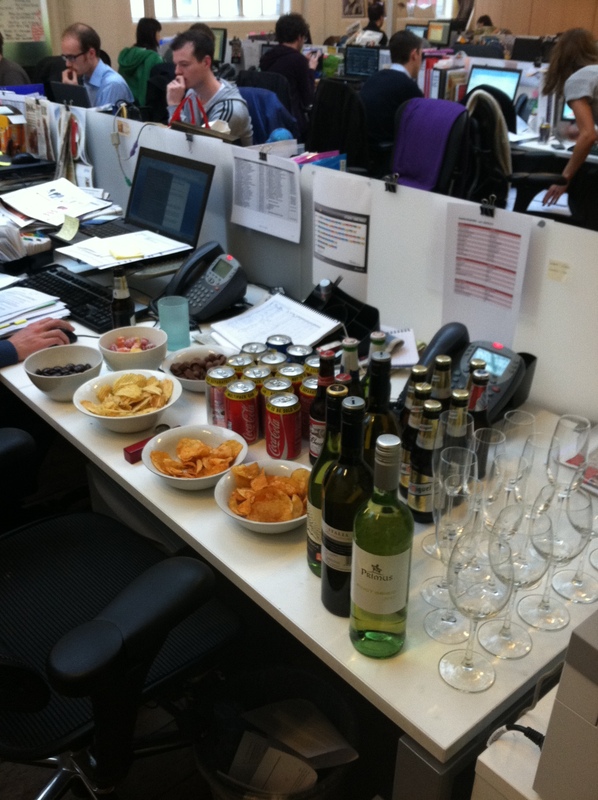 I could get used to a cross-borders career! As the day wound down, the E! 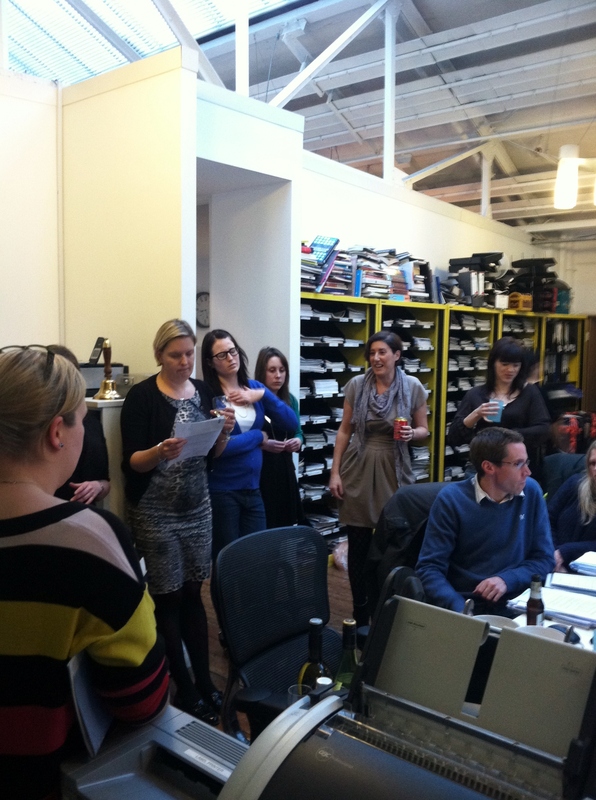 team gathered for their weekly staff meeting, which happens each Friday around 4:00 p.m. Similar to DGC’s Wino Friday tradition, we enjoyed snacks and cocktails while hearing agency updates, press hits of the week and even “grumbles.” I then took some quick snapshots of the team and the space, and was on my way. Leaving E!’s office, I felt completely energized for the future. DGC and Eulogy! have the real makings of a global network–with much to offer our clients and employees. I’m thrilled to be part of it and can’t wait to see what’s in store.